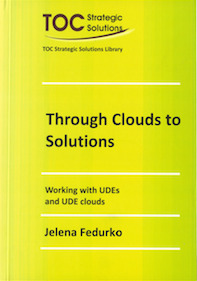 Through Clouds to Solutions is the sequel to “Behind the Cloud.” It continues the subject of Thinking Processes (TP) and focuses on working with UDEs (Undesirable Effects) and UDE Clouds – the major TOC tools for system analysis, and the basis for solution development. Dr. Goldratt demonstrates how to construct, resolve & communicate the TOC thinking processes methodology called Evaporating Cloud. This entry was posted in Books, TOC Weekly 95, TOC.tv, Videos and tagged cloud, cloud analysis, communication, comunicate, conflic cloud, conflict resolution, CRT, Current Reality Tree, Evaporating Cloud, Future Reality Tree / Negative Branch, inyection, solutions, system, thinking processes, thinking tools, toc, tp, UDEs analysis. Bookmark the permalink.